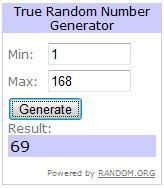 There were 168 entries in the Rockin Green Giveaway!!! Congratulations to the winner for winning a prize in green detergent give away competition. I am sure he will get his prize on time but how about other 168 members? They should also be appreciated in some way. Dont you think so.